Written September 17th, 2013 — Education. 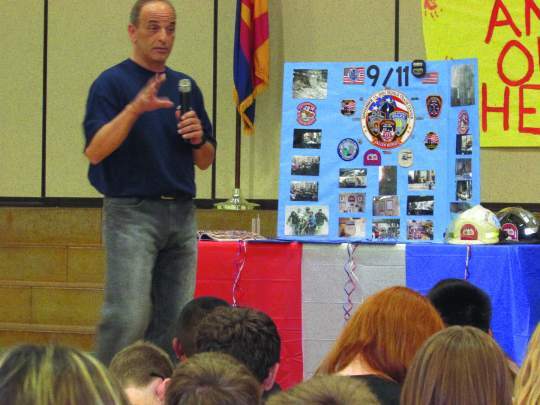 On September 11th, 2013, former New York Presbyterian Hospital EMT Andy Simoneschi recounted his experiences responding to the September 11 attacks on Lower Manhattan in front of a group of about 300 Marley Park Elementary students. This lesson, given by a speaker who was there watching and responding to the injured, is one the students will likely remember for years to come. The now 51 year-old resident of Surprise recalled his experiences that day to the students starting from the time he and 17 other members from the NY Presbyterian Hospital unit pulled up, shortly after the first jetliner struck the trade center’s north tower. He and his unit were there until around 3 a.m. the following day when his team – minus two members – were released from duty. 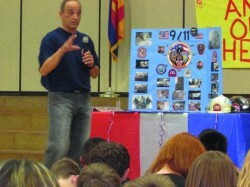 Last week was the third time Andy spoke about 9/11 before students at Marley Park Elementary School. He has spoken to students about the horrific day because, as he says, reading the information online or in a book tells what went on, but hearing it from someone who was there is much more impactful. To learn more about Marley Park schools or for information about the one-of-a-kind community, visit www.marleypark.com or join the conversation on Facebook.